"Fun game that combines the best of Pacman and QIX"
PacXon is the mixture of two classic games in one. Most surely you have played one or both of these classic games. PacMan consisted on easting all the dots on the whole screen while avoiding the ghosts, while QIX was about covering different areas of the screen while avoiding enemies, and not ending until you covered 80% of the whole screen. If you liked one or both of these games, then PacXon could be a great game for you. PacXon combines the best of Pacman and QIX. The game consists on covering the screen while avoiding ghosts. You don't win until you cover 80% of the screen. There are also fruits that you can eat and get special powers. Become faster or freeze your enemies so they cannot move. 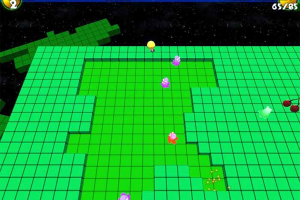 This game is about skills, and it becomes more difficult as you advance through the multiple levels. The game does not consume too much resources, but it requires you to have DirectX 9 or any higher version installed on your computer.